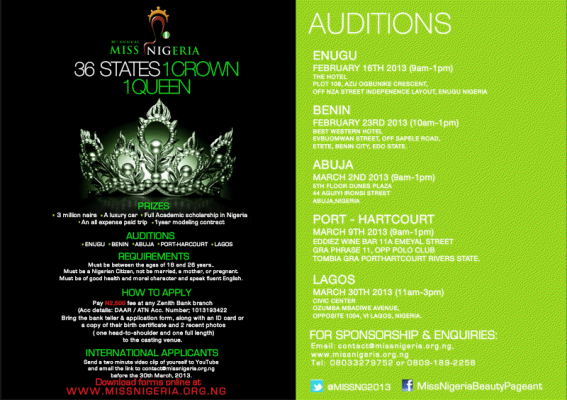 Welcome to Linda Ikeji's Blog: Miss Nigeria: 5 States, 36 Contestants, 1 Queen, the search begins! Miss Nigeria: 5 States, 36 Contestants, 1 Queen, the search begins! For the 38th prestigious Miss Nigeria beauty pageant, ATN and DAAR communications (AIT) with Beth Management Ltd is touring around Nigeria looking for girls between the ages of 18-25 years old, to become the queen ambassador, a role model to young Nigerian women, a spokesperson for charity while showcasing the positive attribute of a Nigerian woman. The casting team would be touring, Port Harcourt, Enugu, Benin, Abuja rounding up with the final casting in Lagos. Auditions will take place from the 16th February to 30th March 2013. The casting aims to maximize the opportunity for girls to participate in the most sophisticated competition. At the end of the casting tour, 36 contestants will be selected to partake in the two-week reality TV show 'THE MAKING OF A QUEEN", in which eliminations will take place leaving 21 ladies to compete for one crown at the Grand finale. Our ultimate goal is to choose a queen based on elegance, poise, talent, intelligence and beauty. 1. Pay in registration fee of N2,500 at any Zenith Bank Branch (Acc details: ATN MISS NIGERIA BEAUTY PAGEANT Acc.Number 1013193422. 2. Bring the bank teller & application form, along with an ID card or a copy of your birth certificate and 2 recent photos (one head to shoulder and one full length to the casting venue). ADDRESS: EVBUOMWAN STREET, OFF SAPELE ROAD, ETETE, BENIN CITY, EDO STATE. Short gals like us are always left out in dese pageants na.Isssookkay! I pray my bff wins dis tho! Linda you don start again.This contest has lost its value.From ene 10 years on the throne. To Nike Oshionowo 2 yrs and no show last year to elohor who's winner of elite model search was the only girl that did not go to china due to lack of funds.What happened to the sponsorship money?Now you have started parading her here on your blog.Linda.The only beauty contest in this country that makes sense is Most beautiful girl in Nigeria.Linda are you all about money?You will report anything as long as they give you kado sha.I know you will not post this but i will put it on twitter where you have no control if i don't see my comment.Congrats baby girl for your new jeep you are rocking the money alone sha. yaaay,wanna be a world queen,so am gonna get my form. Nice one.... Please contact me for your makeover. They really need to give emphasis to the goals behind the contest this time to bring back its glory because the goals of choosing a queen based on elegance, poise, talent, intelligence and beauty as they mentioned have not been achieved for some time now. Also they need to pay more attention to age limit this time, because most of the contestants are always above the ages of 18-25. I cant wait. My sister has applied and told her friends..I believe in Miss Nigeria and i know they would find a real Queen. Wow! This is going to be a life changing experience, mehn! Off to get the registration fee from my boo. Miss Nig,has always been a whacked contest,MBGN is what makes sense! Criteria of 'must not be married'....hahaha.incase the need arises to go 'down low'! Btw dia is money in organising this contests o,will give it and opening church a try soon! Nice. My babe must apply for this. MBGN is no better woman!They are all the same.We hope if Miss Nigeria crowns a reputable,smart and lovely queen,Miss World and Miss Universe will see and grant the opportunity to Miss Nigeria even! Francis and IB Nwodu. Happy Married Life!